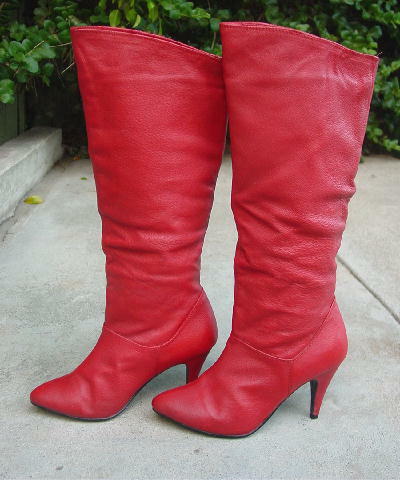 These red leather high heel boots were originally purchased in 1997. They have red fabric linings and black nonskid soles. They have pointed toes and both boots have some scuff marks. The tag says 7 1/2, but they fit more like a size 7. There is a crease on the back side of the right boot. It's probably from leaning against something when stored away. The back of the left boot has some line marks. They're from a former model who owned several pairs. After having two kids, they're now too small for her. She only wore this pair two times. inner top circumference 14 3/4"
top front of boot to bottom heel 17 7/8"
top back of boot to bottom heel 16 5/8"